These shamrock drop earrings are an Irish costume jewelry design that features gold tone metal hoops along with green enamel accented leaves. 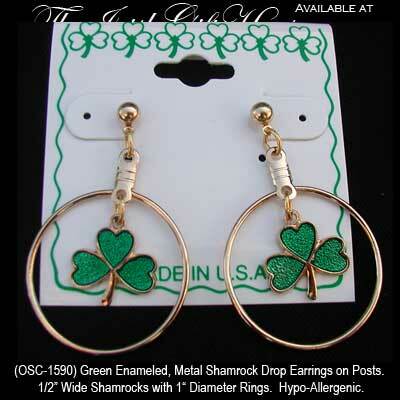 These shamrock drop earrings are set inside of 1" diameter hoops and feature hypo-allergenic posts. The costume jewelry shamrock earrings are made of gold tone metal that is enhanced with green enamel accenting. The dangling shamrocks measure 1/2" wide. The costume Irish earrings are made in the United States and are received with a shamrock history card, complements of The Irish Gift House.